Prior to his appointment at the University of Rochester Medical Center, Dr. Peter Knight was on staff at Rochester General Hospital. 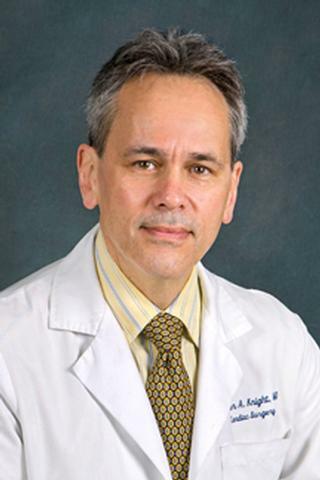 He received his medical degree from New York Medical College and completed his residency in general surgery at Saint Vincent's Hospital and Medical Center. Dr. Knight completed his cardiothoracic surgery fellowship at the University of Rochester Medical Center. Lee CY, Robinson DA, Johnson CA, Zhang Y, Wong J, Joshi DJ, Wu TT, Knight PA. "A Randomized Controlled Trial of Liposomal Bupivacaine Parasternal Intercostal Block for Sternotomy." The Annals of thoracic surgery.. 2019 Jan 0; 107(1):128-134. Epub 2018 Aug 28. Robinson DA, Evans JH, Martellaro AJ, Johnson CA, Sauer JS, Knight PA. "Interactive translational research model and cadaveric simulation: where minimally invasive cardiac surgery and industry meet." Annals of translational medicine.. 2018 Aug 0; 6(15):314. Robinson DA, Sagebin F, Yap AJ, Johnson CA, Knight PA. "Aortic valve replacement with annular enlargement via a right anterior minithoracotomy." Multimedia manual of cardiothoracic surgery : MMCTS. 2018 Jul 26; 2018Epub 2018 Jul 26.